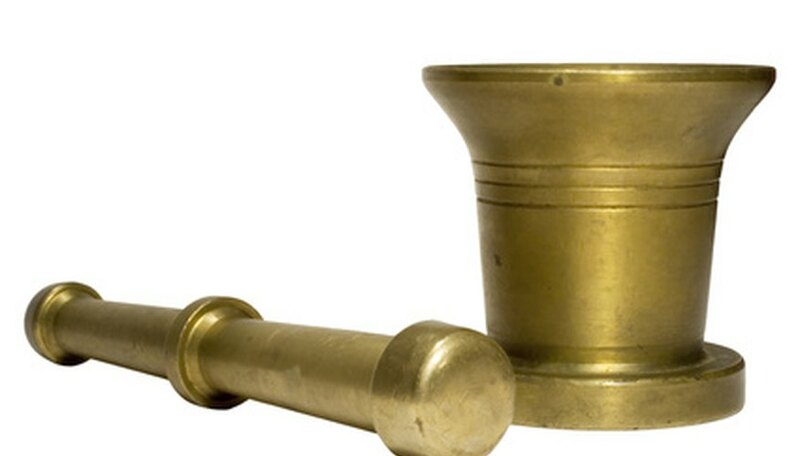 Brass was once a ubiquitous metal that supplied tools, decorations, and cookware for homes around the world. After the beginning of the twentieth century, however, brass fell into disuse and easier to manufacture items took its place. Brass is a mixture of copper and zinc that forms an alloy harder than copper and more durable than zinc. Brass items were formed through casting in which the metal was heated to melting and poured into a mold. When the metal cooled, it could be polished and shaped. Round pieces like a mortar were cast in two sections, then joined together and the seams ground away. Valuable brass antiques are those that were cast prior to 1850. Examine the color. Antique brass is a golden-yellow color versus a more reddish hue found in faux antiques merely made to look old. You may need to polish (or ask the owner to polish) a section of the mortar and pestle to see the color underneath. Study the patina. Antique brass will develop a soft texture and a yellow-brown color. Artificial patina has a rougher texture and a reddish-brown color. Search for seams. Mass-produced brass is cast in one piece, but the old, hand-crafted antique brass mortar will have a seam, though it will be only faintly discernible since the craftsman will have ground and polished it away. Look for a thin line indicating the seam of the two pieces joined together.